Today was the day everyone has been waiting for, vSphere 4 is now publicly available! This also means that all existing VMware customers who want to migrate to vSphere need to start working with the new vSphere license keys instead of the old license files. While a change like this is never easy, the vSphere team has done a good job on make this process as simply as possible through the launch of an updated License Portal. I’ve had a number of clients already ask me about this portal and working with the new License Keys, so I thought I would help the entire VMware community by creating this quick guide to the new portal. 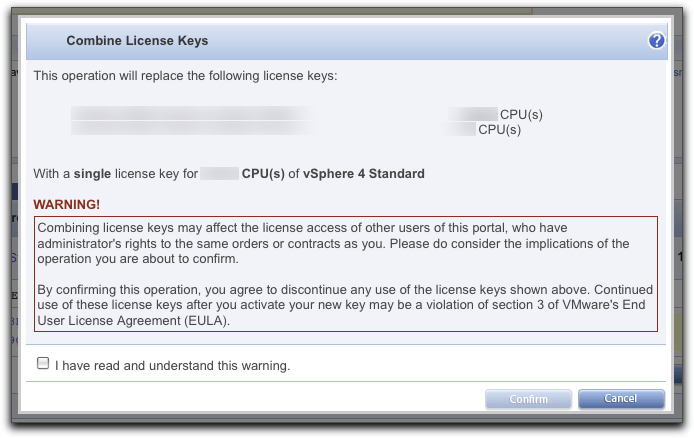 Keep in mind that the change of licensing in vSphere means that the old VI3 licenses that were associated to a pair of CPUs are converted to License Keys that are associated to a single CPU. This is the reason why you may see your license counts double. When you log into your VMware License Portal, you will still land on the page that allows you to manage your VI3 licenses. You can switch to your vSphere licenses by clicking on the tab in the upper right corner, or the vSphere link at the top of the table showing your VI3 licenses. On the vSphere License Keys page, you will see a list of the different vSphere 4 licenses you are entitled to. Expand the row of specific license type to see all keys that are currently available. 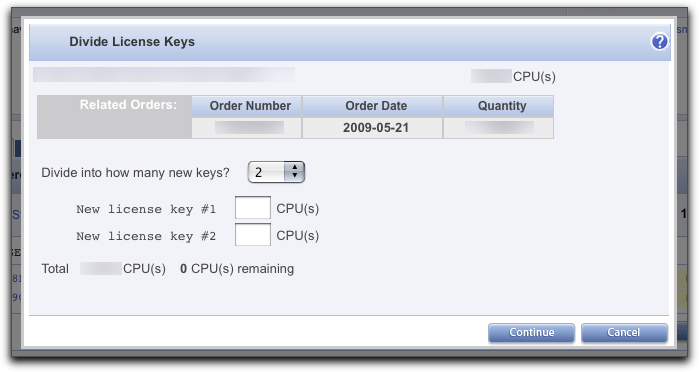 The first time you view your vSphere keys, you will most likely have a small number of keys that contain all the CPUs that you purchased. This is where the ability to Divide and Combine your License Keys comes in. When you click on the Divide button, you can select a License Key that you would like to divide. You can only divide up one License Key at a time. Select the key and click Continue. Now a dialog box will pop up which will allow you to divide up the CPUs from the selected Key. You can chose to divide the key into 2 or more keys. Simply select the number of new keys from the drop down list, and then enter the combination of CPUs you want in the new keys. The information about the order that purchased the original license key is displayed for your reference. The Total value at the bottom of the screen will show you in real time if you’re new keys have used all the CPUs from the original key. Lastly, a dialog box will pop up confirming the new license key division you just configured. There is also a warning that the change you are about to make could affect others. By clicking Confirm you old license key will be divided up into your selected number of new License Keys. The division process is what you will use to take your original license key containing all your entitled CPUs and carve out smaller license keys for deployment across your organization. From your list of License keys, clicking on the combine button will also you to select which existing License Keys you want to combine into a new larger License Key. Select the specific keys using the check boxes on the right, then click Continue button. Next a confirmation dialog box will appear to confirm these are the keys you want to combine. Again, a nice and concise warning about affecting other users and your EULA. 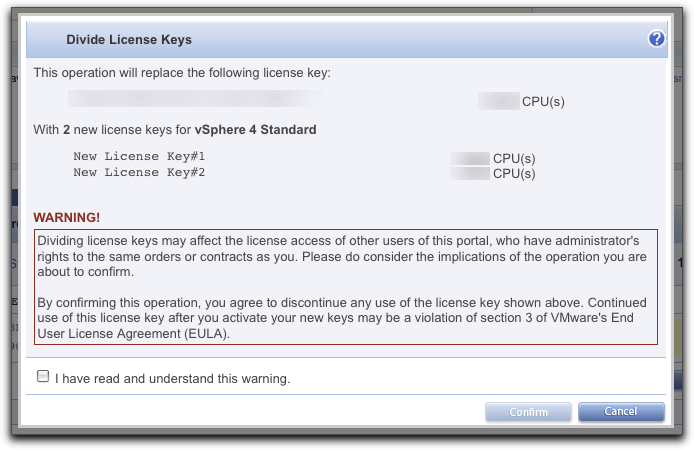 After combining (or dividing) your License Keys, you will see an updated list of vSphere License keys. By expanding a single license key, you can add additional comments to the license key in the portal. 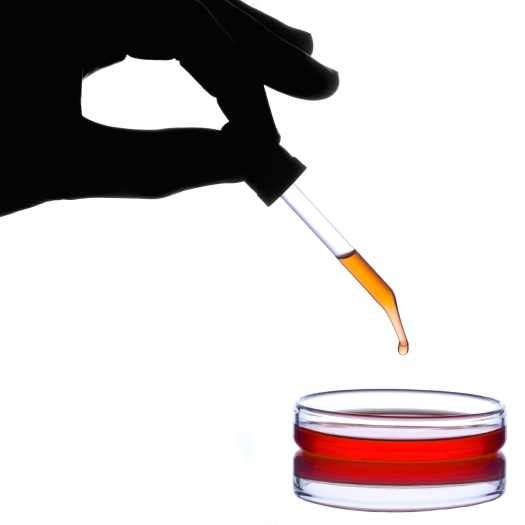 This is valuable to keep track of who a license may have been created for within your organization. Under the License Key History tab, you will find the ability to search through your list of License Keys. Most Enterprise customers will end up with hundreds of license keys created by and for multiple groups within their company. The search capabilities now allow you to search based upon the Event Type associated with a key. So if you’re looking for history on who divided a key, you can find it. While not an all inclusive guide to the new vSphere License Portal, hopefully this quick guide will help you get up to speed dealing with the migration from VI3 to vSphere 4. For a full tutorial on vSphere Licensing, make sure to check out the vSphere Migration – Licensing video. Also check out the vSphere4 Licensing Guide (pdf) and VMware Product Licensing Center. Great guide Greg. Several of my clients have commented on this.